"This is a favorite holiday treat for my family. 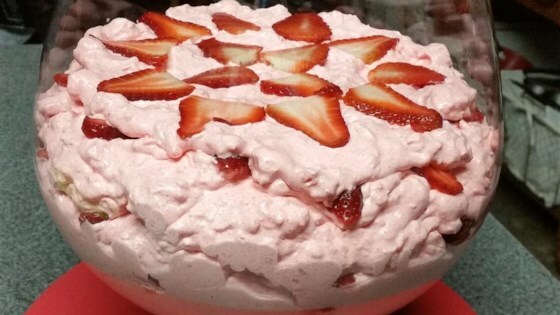 It can be made with sugar free gelatin, fat free cottage cheese, and fat free cool whip for a lower calorie treat. This is an EASY and quick treat!" My grandmother always fixes this recipe. If you first let the gelatin sit in the refrigerator until it begins to gel, then add the remaining ingredients so they don't seperate. Fabulous! Just like grandma used to make. It's even fluffier if you let the gelatin thicken a bit in the refrigerator and then whip it until it's foamy before adding everything else. A quick and fast side to make for just about any dinner. We enjoyed this recipe and will enjoy making it in the future.